The 10th of August can’t come quickly enough! You may have heard of this game, you may have not. It doesn’t have the sheer weight behind it like a new Call Of Duty or a FIFA, but it’s got a lot of people talking about it.. with good reason! 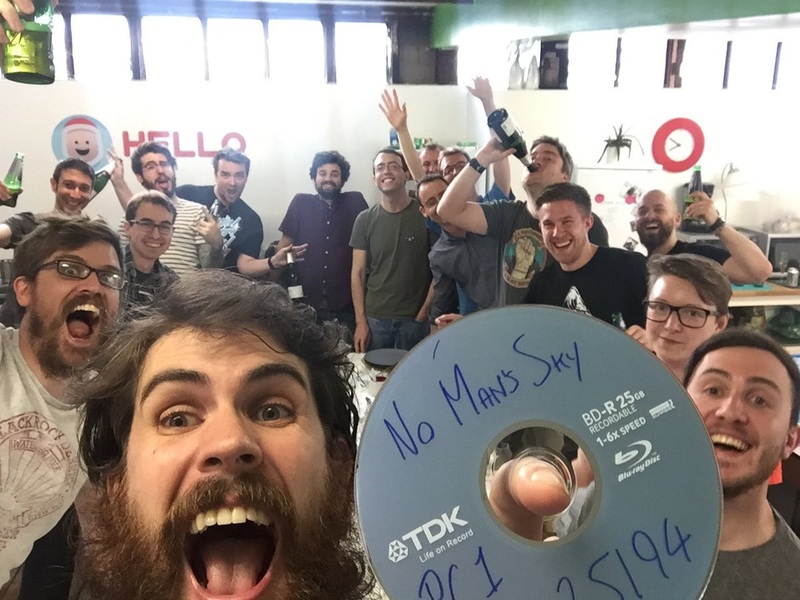 No Man’s sky is a title developed by Hello Games, for the PC and the PS4. It’s an upcoming action-adventure survival video game (straight from the Wiki) and will have you exploring the cosmos. Unlike other space exploration games (for example: Mass Effect) there isn’t a set number of locations you can visit. 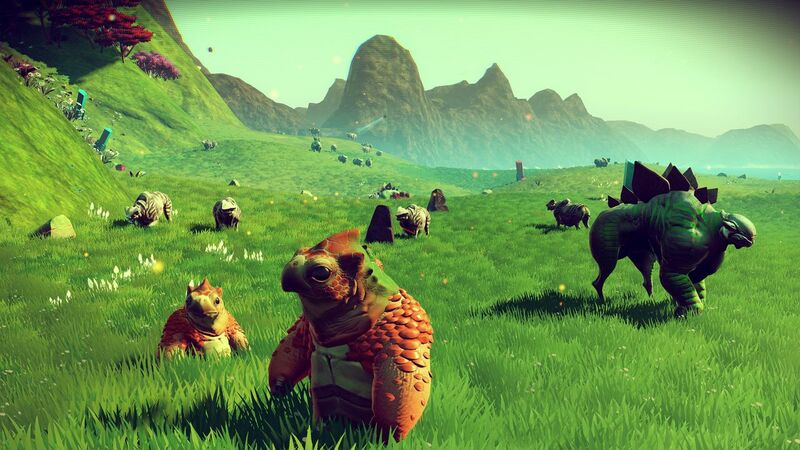 The planets on No Man’s Sky are procedurally generated, which means the game creates them by itself, at random. Again from the Wiki – Over 18 quintillion combinations or flora and fauna are available! Holy Hand Grenades, that’s a lot of ground to cover. It also means that your No Man’s Sky experience will be truly unique. There will be bad guys to fight, harsh conditions to endure, resources to collect and gear to upgrade. Anything you learn along the way, about the planets or the game’s story – can be sent to a central database so that other players can see the information and use it in their own games. You’ll be paid for this information, and you’ll need the cash too – to get further into space, you’ll have to upgrade your ship’s engines. You’ll discover alien races, with their own language, technology and their own ships. Will they be friendly? Who knows. Apparently, if YOU start to get nasty and kill too many lifeforms, you’ll attract the attention of the Sentinels – and now all I can think of are the spider-robots from the Matrix! Wouldn’t want anything like that after me! 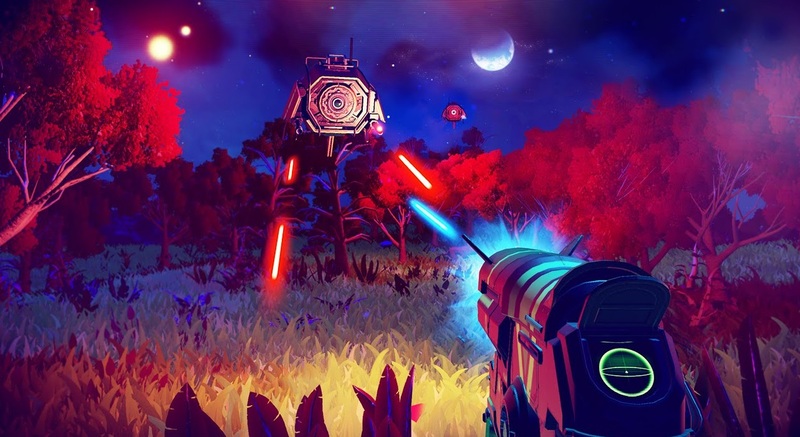 A lot is still to be discovered about No Man’s sky, which is quite fitting considering the nature of the game, but the interchangable planets, weather, enemies and surprises sound great, and space combat has always been a favourite genre of mine. Even the music will be generated on the fly, a truly unique concept. It’s incredible to think that the PS4 can handle all this! The trailers and gameplay that ARE on show right now depict crisp, beautiful landscapes, swirling wind and some gorgeous weather effects. The game is played in first person however the game leans more towards exploring than “shooting everything”. Saying that, there IS a lot of destructible scenery. One video shows a developer firing at a random wall and heading straight through the hole he’s created, taking shelter from the icy wind in a cave. I’m sure the game will be riddled with puzzles to solve and secrets to uncover, although how this will fit in with the random world building I don’t know. If you’ve learnt anything from my posts here on Load/Error, it should be that I always crave something new, something different. No Man’s sky promises exactly that, and on the 10th of August, we’ll see if it can actually deliver! I hope I’m as happy with the game as they are! Posted on July 27, 2016 July 27, 2016 by itsonlyleggyPosted in ModernTagged Preview, PS4. Previous Previous post: A Blast from the past – Bad Influence! This title looks very exciting and unique and apparently doesn’t require playstation plus membership to be played! This will be the reason I start playing my playstation 4 again, and it my prove to be one of the most original titles of this current generation. Can’t wait to play it day one and start a logbook (yes, I’m going to make one). Don’t know if it will be great or no, but just the idea of being able to fly through an almost infinite universe, seamlessly landing in big planets, discovering things makes me want to try it. And then we have the options to trade or fight, the survival part and the question: what are we going to find when we arrive to the center of universe? You can’t wash robot spiders down the bath like the regular kind. I love a good journey in a game, being able to wander around in my own time and just experience what the game world has to offer. That’s what is attracting me to this. I think it’ll be fantastic, and I think it will keep me coming back for more!